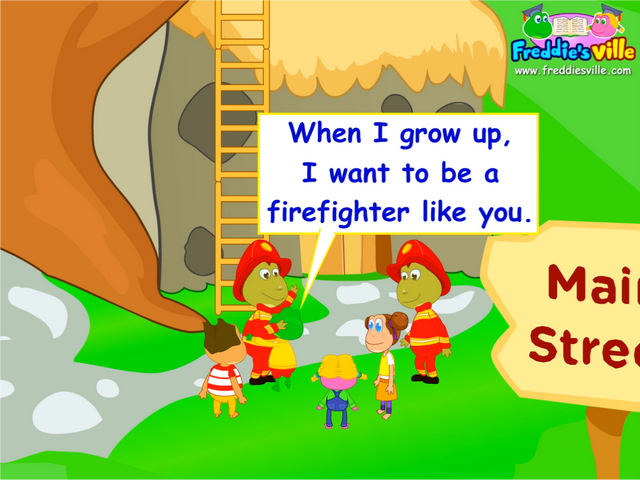 Communication Objectives: In this lesson, children will learn to talk about what they want to be when they grow up. The lesson will focus on jobs and occupations vocabulary. Language Objectives: To learn to express future job intentions using ‘want to’. Dialogue Story: Freddie is at home when he notices smoke rising from Bob’s house. Mom orders Freddie to call the fire department. They come in time to put out the fire and rescue Bob and Sally who are trapped inside the house. Freddie phones his dad who is a doctor, to come home and attend to them. Mom is also a trained nurse and her expertise comes in handy. Impressed by the timely intervention of the firefighters, a doctor and a nurse, the children express their intentions to do these jobs when they grow up.